What is the story on this bracelet? I recently purchased a bracelet which was made by Tom and Sue Kee. Can you explain what the story is about? I can send you a picture. I am not selling my jewelry. We just were in Arizona and it was purchased at Black Arrow Indian Art in Prescott Arizona. It cost approximately $200. My husband purchased it as a gift for me. I have attached the photo. I only want to know what is the story on this bracelet. Storyteller bracelets show Navajo life. The home (hogan) and the activities around the home such as cooking, weaving, tending livestock, driving a wagon to town. The scenery of the area such as buttes, trees and shrubs and sometimes clouds are also depicted. It is hard for me to see the exact details of your bracelet in the photo but if you click on some of these bracelets you will see some of the typical stories depicted. Enjoy your beautiful bracelet !! A lovely gift from your husband. This entry was posted in Bracelets, Hallmarks, Navajo, Overlay, Storyteller, TSK Tom and Sylvia Kee and tagged bracelet, cuff bracelet, native american, navajo, storyteller, tom and sylvia kee by Native American Jewelry Tips. Bookmark the permalink. “Storyteller” is the name we call this kind of work but it’s kind of a misnomer. These don’t actually tell a story about a particular event, family or location. They depict typical activities and scenery, including my favorite, the very common goats who sometimes stand on pickup hoods. Yes, everyday life. You know Russ, I’ve been told by a number of people, both Native and farm animal experts, that the “goats” that you and I both thought were goats are actually Churra (AKA Churro) Sheep as shown on this bracelet in particular. 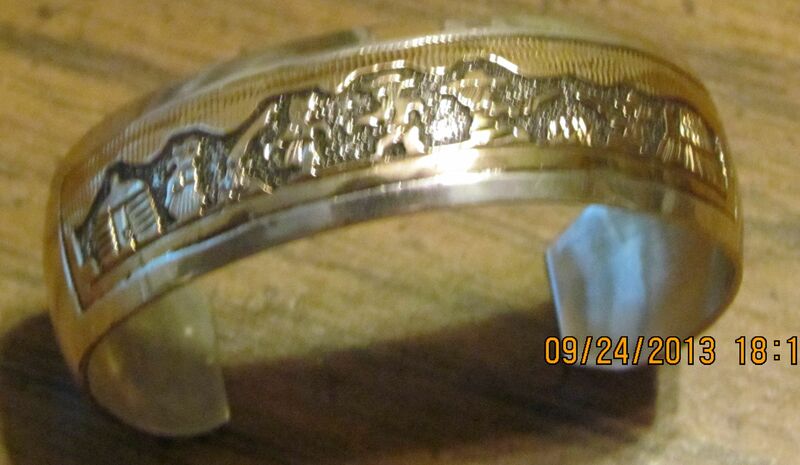 http://www.horsekeeping.com/jewelry/pawn/bracelets-pawn/BP152-WB-7-story-gold-kee.htm From that page……. Native Americans were first introduced to Churra sheep brought to North America by colonizing Spaniards in the 1500s. The Navajo proved to be very good herders and weavers and Navajo-Churro sheep became a main source of their negotiable wealth. 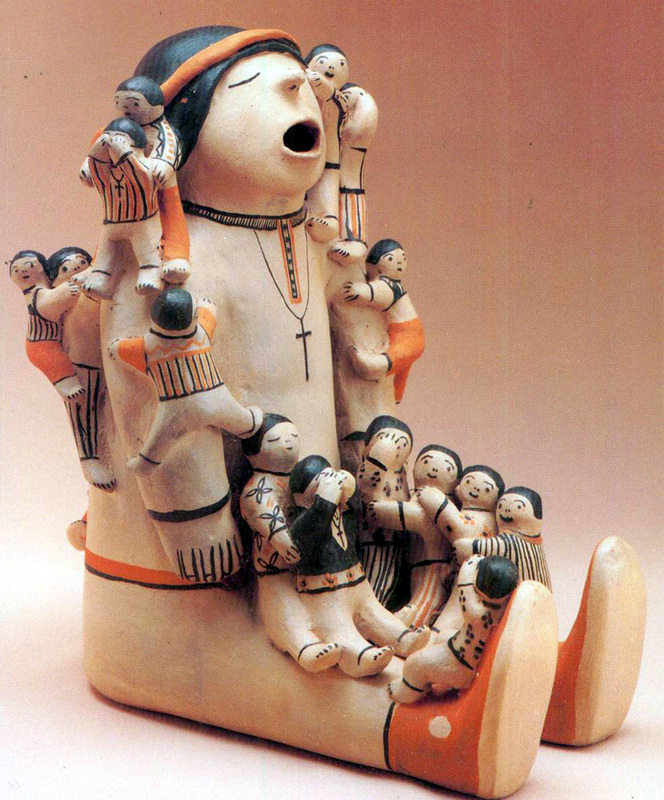 Sheep images in Native American art represent charity, patience, gentleness and riches. That’s not to say some southwest NA don’t raise goats, but if you google churro or churra sheep and then Navajo goats, you will see that they are the same…….but they really are churro sheep. Anyway, that’s my story and I’m sticking to it !! LOL !! Ha ha ha, You may be right Paula, Churro sheep vs Nubian goats. It’s been 50 years since I last herded goats in Washington state. I wasn’t all that good at it because we lost a few to coyotes. Whatever the case, I loved seeing those critters jump on the hood of a wealthy Gallup trader’s fancy car while they were buying jewelry out on the rez. My old van must have been too tall for them because they never got on top of it. And I loved that reference earlier to them jumping up on a pickup – usually that’s OK since the pickups are often vintage rez pickups like the ones Merle House Jr. and others sometimes feature in their inlay jewelry. So you’ve been a goat herder too…..what haven’t you done !!?? I love your info and tips, Paula. Your items for sale are also fantastic.